Diamond cutting discs, or as they are also called, diamond wheels, have several advantages compared to conventional abrasive counterparts. They have significantly greater performance in terms of resource, cutting accuracy and productivity. Next, we will look at how to choose a diamond disc for the grinder, what kinds of discs exist and what is their advantage. Diamond cutting edges for waterless cutting were first created at the design offices of the Japanese company Sankyo Diamond Tools, a division of Hitachi Corporation . Many technologies were used for the first time, therefore the circles were not reliable enough and quickly broke down. For example, the diamonds and the cutting part were fastened to the steel base with the help of high-temperature soldering. In the process of work, when a large friction force occurred, the metal heated, the solder melted and the working part simply fell off. With water cooling, such circles worked more or less tolerably, but with dry friction, their life was small. The fact is that a diamond does not cut material, but abrades it into dust, large friction forces are accompanied by rapid heating - heat does not have time to be discharged through the body of the circle, moreover, despite the presence of special slots, the circle is deformed when heated . The shape changes are minor and do not threaten to break, but the strength of the joint is adversely affected. Sankyo Diamond engineers offered other solutions - sintering the working part and the base under high pressure. 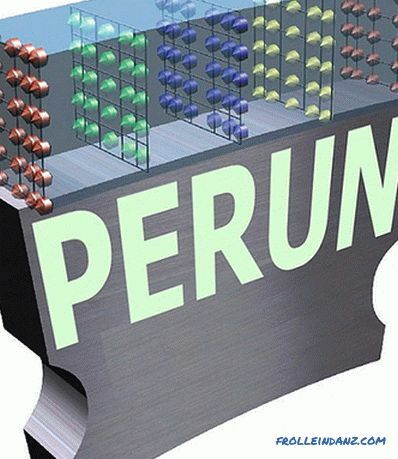 Such a compound is more durable and withstands significantly higher temperatures. 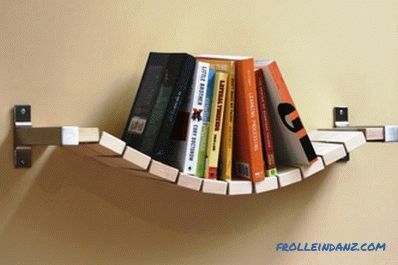 Thus, it was possible to create segmented and solid discs that are resistant to heat and deformation. The technology is still used. The second solution is laser welding at the molecular level. According to this technology, only circles of a segmented type are produced. In terms of durability and reliability, the discs of both types are almost the same, although many professionals believe that manufactured by laser welding is better. Most diamond discs are used on angle grinders with a speed of up to 12,000 rpm. The maximum number of revolutions that the best laps can withstand is 13900 rpm, but there are not too many tools that can develop them when cutting. Only the diamond itself contacts the surface to be treated - it protrudes above the surface of the rim and, while rotating, wets the material into fine dust. 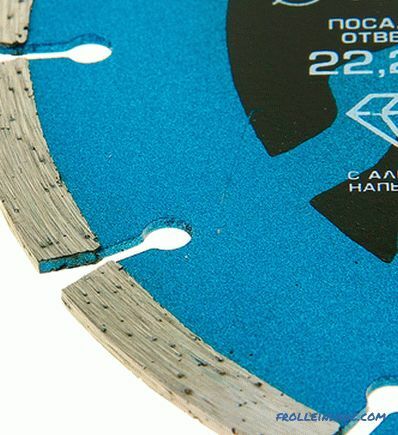 The multi-layered structure of the cutting edge ensures that the disc is always ready for use - diamonds that are rubbed off or come out of the socket are replaced by others that are in the lower layer of the rim. Excess heat is discharged along the disc body, but, nevertheless, it heats up to sufficiently high temperatures, which requires adherence to certain safety rules for dry cutting. The durability of the wheel and its effectiveness depend on the size of the diamonds. Large ones ensure the efficiency of work, but they quickly wear out, small ones cut very accurately, but more slowly, their service life is 25–30% longer than that of a tool with large fractions of crystals. 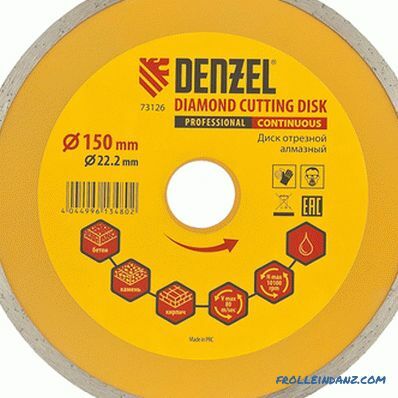 Structurally, the diamond disk is a steel circle with a cutting part and cuts throughout the area, which contribute to heat removal and reduce deformation stresses. Diamonds are interspersed around the rim of the disc. They are inserted into the rim of nickel, zinc, cobalt and tin alloys. With a linear motion speed of up to 80 m / s and enormous friction forces, the mount must be exceptionally strong, which is achieved using special technologies. To ensure that the cutting part is held at high loads, they can be fixed by laser welding, sintering, electroplating or soldering. Soldering is used only in discs for cutting with water-cooled machines. Depending on the method of fixing the diamond, the purpose of the disc is determined. Diamonds fixed by electroplating are designed to work with soft types of natural stone, treated with laser welding and sintering, especially segment ones - for all types of solid materials in a dry and "wet" way. Holes and slots are strictly symmetrical, and the mass of diamonds in diametrically opposite directions is also balanced. 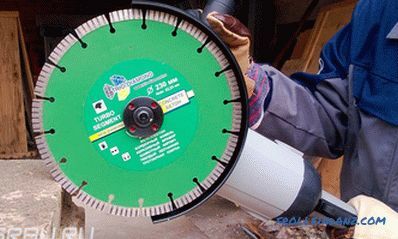 This eliminates vibrations and "beats" of the disc and ensures uniform cutting. 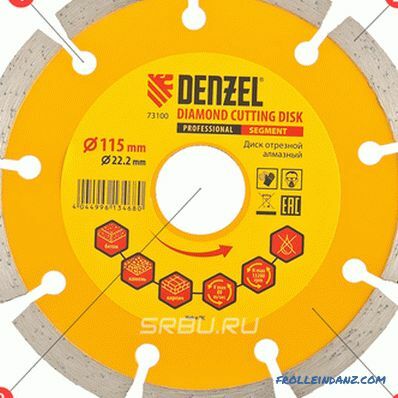 But to use circles for dry cutting can only be used to perform a straight cut - with a curved path, a disk can not only lose diamonds, but also collapse. This type of tool is very sensitive to lateral loads. 1. Damping slots. 2. Cutting layer. 3. Seat hole. 4. Steel disc. Diamond cutting discs have certain differences in design and manufacturing technology. Solid diamond discs. Equipped with a continuous cutting tape running around a circle in which artificial diamonds are interspersed in several rows. For cutting ceramics and other materials where cutting accuracy is the main parameter, circles with a solid edge are preferable. Segmented diamond discs. The segmented sections are divided by radial slits into several working sections of the same size, they are more resistant to mechanical and thermal loads and are used more often than solid ones, although they are somewhat more expensive. They are more productive than solid, but the cut after them is not as accurate. 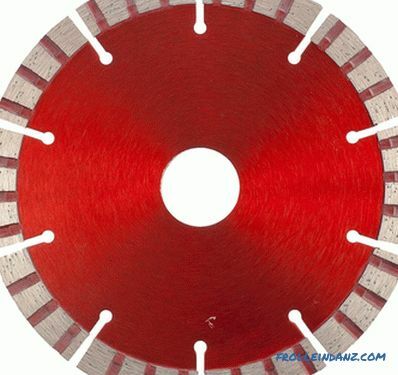 It is best to use them for rough cutting of concrete structures. Diamond wheels turbo. Turbodisks are distinguished by the presence of a scythe (and not only) notches on the sides of the rim. It slightly increases the mechanical strength of the wheel and significantly increases the intensity of heat removal, which allows accelerating cutting from 50 to 100%. 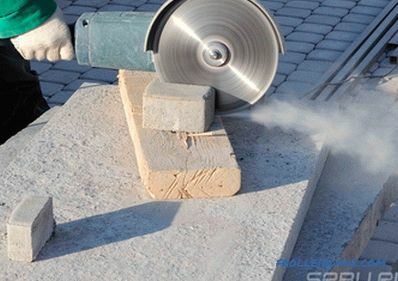 Like the segment discs, turbo is suitable for fast cutting of any mineral materials of a wide range of hardness - from sandstone to concrete and granite. Diamond discs are turbo-segmented. Even more productive circles, divided into segments with a side notch "turbo". 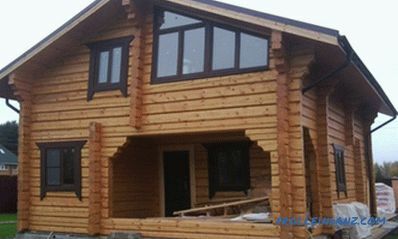 They are characterized by high performance and versatility. Artificial diamonds are fixed in the working rim in a certain order. There are circles with their uniform distribution, when the same number of crystals is in any of the selected units of length or segment. But there are also circles in which diamonds are placed with a certain period (the so-called sandwich ones). They are more productive, providing less force on the tool, more efficient cooling and even distribution of effort. 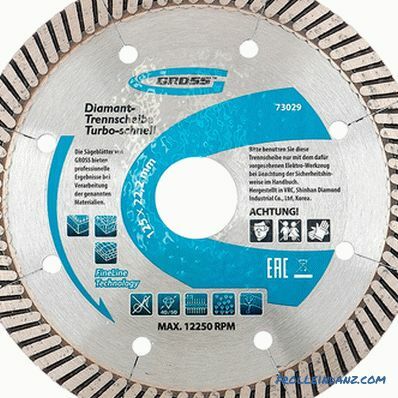 By cutting method, diamond blades are divided into circles for dry and wet cutting. The first ones provide an accurate cut and more “clean” in work, but they require the use of dust suction devices - when cutting, very small particles of hard materials are formed that irritate the eyes and the respiratory tract. Water-cooled circles operate with a constant flow of fluid that binds and washes away the dust, but it is not always possible to use them. This is due to some cumbersome hydraulic system and the formation of drips. 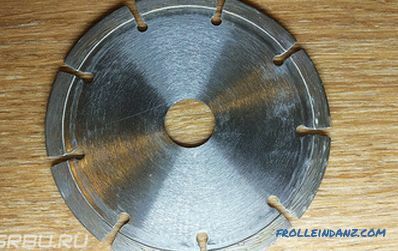 Circles for dry cutting can be used in water-cooled machines, but you cannot use wet-cutting discs without cooling - they overheat and quickly collapse. When selecting a diamond disc, you should pay attention to the type of material for which the disc is intended for its size, seating diameter and disc rotation speed. Most diamond wheels are designed to work with non-metallic materials. Most often they are used for cutting concrete, ceramics, glass, brick and asphalt. But there are a number of discs created for cutting metals of different hardness. When buying, remember that different types of diamond discs are designed to work with different materials. 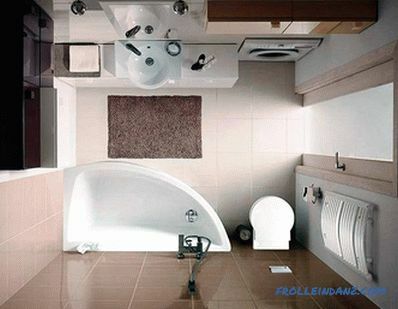 There are discs designed to work with concrete, ceramic tiles, marble, granite, sandstone, stone and asphalt. There is a certain rule for the choice of a disk - for soft materials, circles with a hard diamond strapping are selected, and for hard materials - with a soft one. This is determined by the degree of wear of artificial diamonds on the rim of the circle. 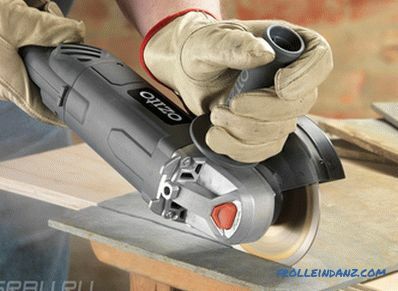 When cutting hard materials, they wear out faster and the next ones take their place from a fairly soft cutting strip. Soft materials do not affect diamond much, it should stay in its place for as long as possible, which is provided by the solid substance in which the mineral is interspersed. In addition, various artificial diamonds are used for different circles. Polycrystalline, consisting of several strongly interconnected smaller monocrystals. The former are very durable and are used to cut hard materials and metals, the latter can break down on contact with them, and therefore are used on cheaper tools designed for relatively soft materials. The maximum cutting depth and, in some cases, the speed of work depends on the size of the disk. The main diameters are 115, 125, 180 and 230 mm, which corresponds to abrasive wheels for angle grinders of the most common grades. Diamond disks with a diameter of 150, 300 or more millimeters can be found on the market. Large diameters are installed on powerful cutting machines - gas cutters, stationary type cutting machines, etc. The most common disc bore holes can be - 22.2 mm or 25.4 mm. Only buy a disc of the size for which your instrument is intended. Never install a large disk on the grinder, which is designed to work with a smaller disk, after removing the protective cover. This is very dangerous, since the destruction of a metal disk can cause fatal damage to your health. If you have such ideas, then find on the Internet a photo of the consequences of working with a diamond disc without a protective casing and you will forever work without protection. Also on disks the maximum rotation speed and linear speed are indicated. If the capabilities of your tool exceed the characteristics of the disk, then you can’t put it - the centrifugal forces will simply tear it apart. 1. 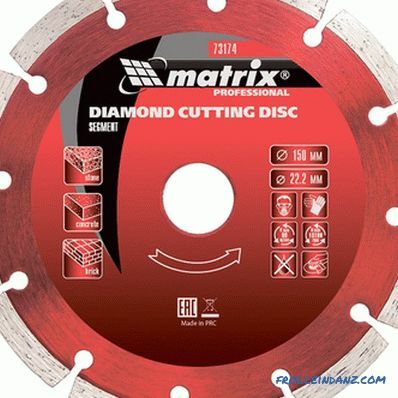 As already mentioned, diamond discs are designed exclusively for straight cuts. 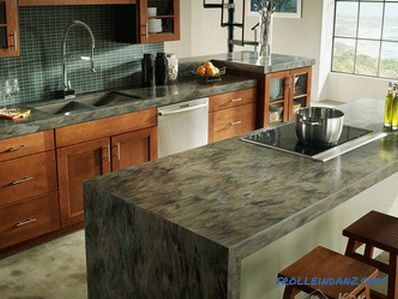 The cutting speed and feed force must be adjusted so that the working area does not overheat. When the temperature of the rim is above 700 0 C, artificial diamonds graphitize and lose a significant percentage of strength. You can increase the disk resource in a simple way - periodically remove it from the cut without turning off the angle grinder motor. The air flow cools the disk and relieves thermal stresses between the central part and the working area. Another way to increase the service life of the disc is not to perform cutting too deep in one pass. It is better to go through the same trajectory several times. This will slightly increase the operating time, but the tool life will be twice as long. 2. 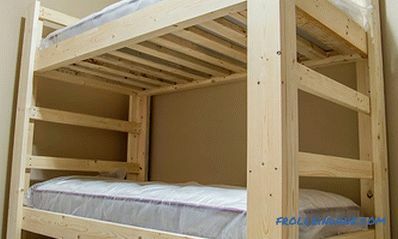 One of the main problems encountered in the work is the rapid wear of the working area. This is primarily due to the wrong choice of tool, too high feed rate (clamping) or the status of the angle grinder. If beats arise in it, then the disc lifetime is sharply reduced, in some cases, with particularly large oscillation amplitudes, it can collapse, which is very dangerous. 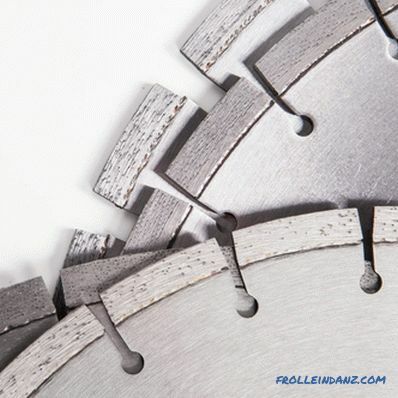 If the side of the disk below the cutting edge is worn out, then the feed flow is disturbed or a drive defect occurs that creates a side runout. 3. When the segments are blunt, it is necessary to replace the disc - it is not suitable for this material. If the disk is selected correctly, but such a picture is still observed, it is necessary to cool the disk more often. It overheats due to excessive load. The same reasons lead to a change in the color of the base of the disk - a bluish tint appears on the steel circle. 4. If there are cracks on the disc, replace it immediately. The disc cracks if the material does not conform or is working too hard. Often these defects appear after seizure in cutting, or skewing when working. To avoid trouble, inspect the disk before work and periodically during operation, stopping the tool. 5. 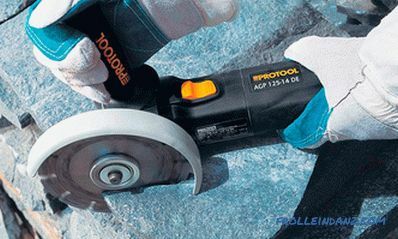 It is not allowed to work with a diamond disc, if the angle grinder or other instrument is faulty - lateral and radial beats, uneven rotation, an uncontrolled increase or decrease in the rotation speed occur. In this case, the tool must be handed over for repair or buy a new one. do not exceed the allowable turns. When working with diamond discs, gloves, glasses and respirators are required.